October 8, 2012 By arzea 33 Comments This post may contain affiliate links. Read my disclosure policy. A few weeks ago I posted about my Dresser Turned TV Console, and I had asked what I should put on the middle shelf….books? Magazines? A photo? Apparently none of those were good choices, and a basket was the the overwhelming favorite. So, I set out to find a basket. I wasn’t having much luck, and who would have thought finding a black basket would be so difficult? I finally found one, but it had an ugly basket liner with it. I forgot to take a picture, but it was this cream/red floral pattern, and I knew it had to go. 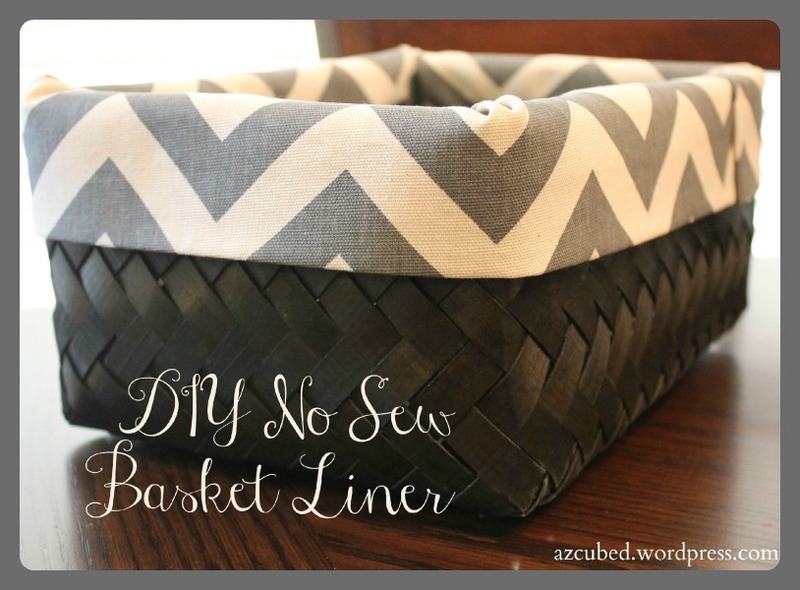 Without the liner the basket would be perfect. Well, then I got it home and took the liner off, and there were visible staples going around the top of the basket…um, why?? Ugh. I decided to take a piece of leftover scrap material from another project, and make a ‘liner’ for the basket. Well, it’s not really a liner, but more like a cuff to decorate the outside (what is that even called???). Anyway, this was the easiest project ever. I was waiting for my legs to dry for my DIY Ottoman (coming soon! ), and I figured this would be a quick project to do while I waited 20 minutes for them to dry. It took about 5 minutes, or less, and I only expense was the basket, which was on clearance for $4 at Joann’s. 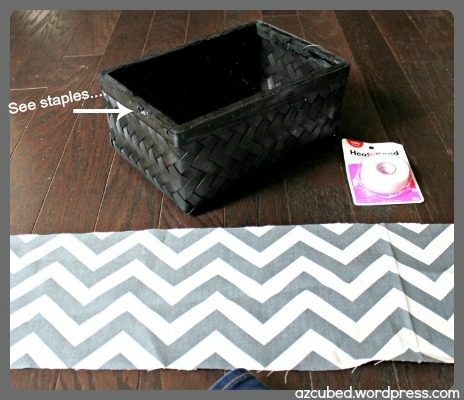 All you need is a basket, scrap fabric (like this awesome chevron print!) to go all the way around your basket (mine was just standard 54 inches, and I had a bit extra), hem tape (or I guess you could sew it), and hot glue. I took the fabric and made a hem on one side. Make sure it is even and straight, and then place the hem tape on the back of the fabric, and fold fabric over to make hem. Iron over it to activate the hem tape glue. Once you have the ‘hem’, put the fabric around one side of the basket and determine how far inside the basket the fabric will go (look at the outside of the basket, because you need to see how far the hemmed/straight side will be hanging down on the outside of the basket). Pick a place and start gluing! 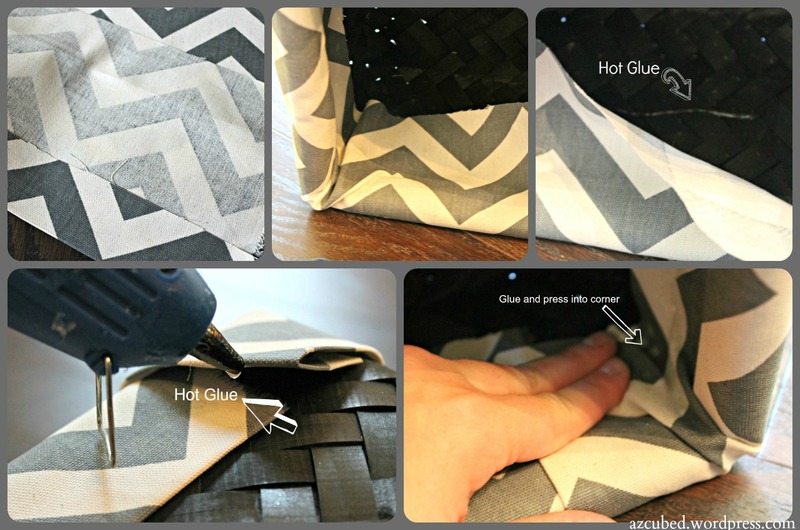 Run a line of glue along the basket, and then press the fabric down. Repeat for all sides, pressing into the corners as you get to those. I also used a small piece of hem tape on the end of the fabric, to make a neat straight line (see pic above on left) on the outside where it would come together. We tossed the extra remotes into the basket and I am sure will fill it with other things as well! What do you think? Great job, love the Chevron choice. You were waiting for your legs to dry? lol, yep, for the ottoman I made! thanks for linking up to Heart+Home! 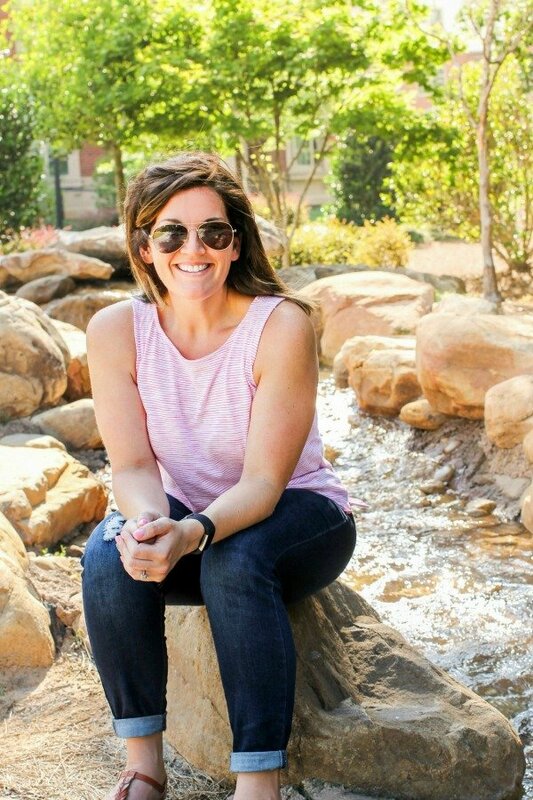 Thank you for hosting and stopping by my blog!!! You have such good ideas! Definitely following your blog to keep up to date with all your fab projects! It looks fantastic! Love love love the Chevron print! Thanks so much for linking up to totally Pinworthy! Thank you, and thanks for hosting! Thank you for stopping by my blog! I don’t even know why I thought of this, but I am so glad I did. It was so easy to use scrap material and it was so quick and easy. I imagine the fabric would be easy to rip off (since it’s only hot glue) and change out to a different fabric if you get sick of whatever you pick in the first place! Thank you, Val!! Come back and see me again!! That basket looks fabulous, the liner really makes it work! Thanks for linking this up to The Fun In Functional! 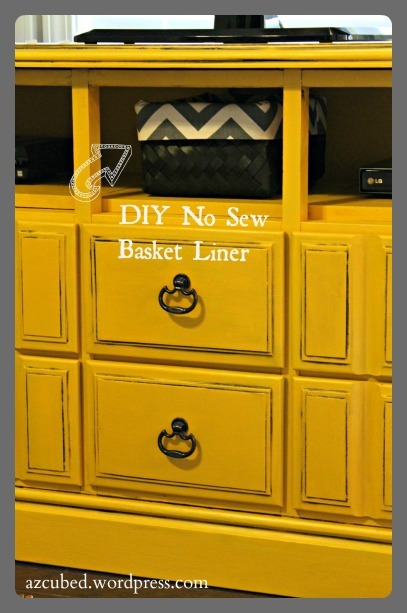 Great idea, basket looks great! Great job! How did you attach the pieces of wood on the top shelf? The 3 pieces you had cut at home depot… Liquid nails? 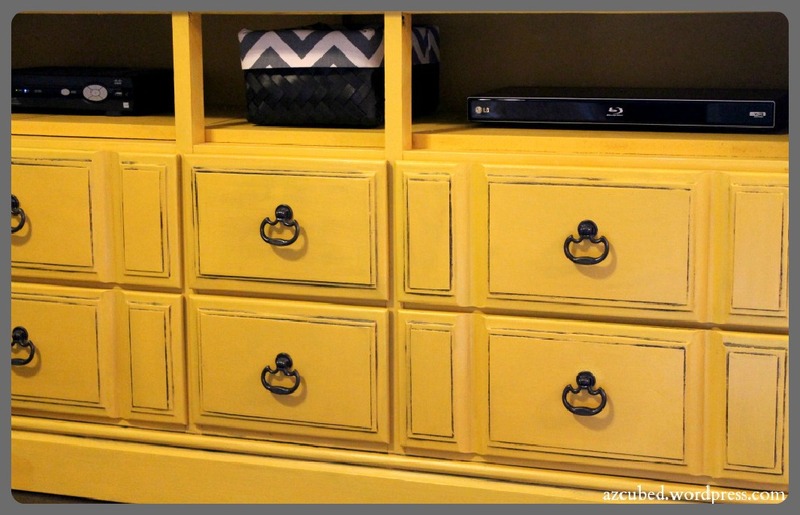 Are you talking about for the DIY Dresser to TV Stand? I just cut them to fit, and rested them inside. It was a tight squeeze so I didn’t have to secure them.